Parents, you’ve got some summer reading to do. How can we keep our kids engaged and continue healthy brain development when school is out? Through reading! Summer reading isn’t just for students. Our summer reading list for parents gives you the opportunity to cultivate a stronger connection with your child. As well as improving emotional regulation and confidence for your child and within yourself. Our kids are already overworked and overwhelmed throughout the school year, and many of us would rather not add more work for them during their break. But, studies show many struggles come when the school year begins due to increased anxiety (and few tools to manage it), schedule changes, poor diets, lack of brain boosting activities and too much time indoors during the summer months. UnSelfie: Why Empathetic Kids Succeed in Our All-About-Me World by Michele Borba Dr. This amazing book helps parents and educators understand how to fight against the empathy crisis. Dr. Michele Borba 9-step empathy-building program with tips to guide kids from birth through college is hailed not only as a must-read but life-changing. The fact is, teens today are forty percent less empathetic than they were thirty years ago, hurting kids’ academic success and leading to bullying behaviors. This lack of empathy can follow them into adulthood, preventing them from being able to collaborate with others. Try Dr. Borba’s 9-step guide for teaching empathy to your child today. Parenting a Teen Who Has Intense Emotions: DBT Skills to Help Your Teen Navigate Emotional and Behavioral Challenges by Pat Harvey & Britt H. Rathbone. If your child sometimes finds it difficult to regulate his or her emotions, this is the book for them. Parents of kids or teens who lash out or engage in troubling behavior may be unsure of how to respond to a child in a compassionate, constructive way. With evidence-based skills for dealing with out-of-control emotions using proven-effective dialectical behavioral therapy (DBT) and tips for managing your own reactions, this is an amazing book for helping your child effectively deal with their feelings and have a positive impact on their future. The Teenage Brain: A Neuroscientist’s Survival Guide to Raising Adolescents and Young Adults by Frances E. Jensen & Amy Ellis Nut. Neurologist Frances E. Jensen, M.D explains the science of the teen brain (the functioning, wiring, and the capacity), suggesting how adults and teenagers can negotiate the mysterious world of adolescent neurobiology. Contrary to past thoughts, the adolescent brain is very different from the adult brain. This comprehensive book helps parents, educators, and even the legal system support teens navigating their way more smoothly into adulthood. The Happy Kid Handbook: How to Raise Joyful Children in a Stressful World by Katie Hurley. Ever feel like you have to be the perfect parent? You’re not alone. With all the “parenting advice” parents are met with at every corner, it’s hard not to become bewildered, and all the many parenting theories out there, children’s happiness feels like it has become incidental. Psychotherapist Katie Hurley shows parents how happiness is the key to raising confident, capable kids. Not every child is the same, and not every child will respond to parenting the same way, so Hurley explores the differences with this definitive guide for parents full of specific strategies from a social-emotional perspective. Parenting Your Anxious Child with Mindfulness and Acceptance: A Powerful New Approach to Overcoming Fear, Panic, and Worry Using Acceptance and Commitment Therapy by Christopher McCurry PhD. Having anxiety is normal, for both you and your child, but sometimes it can overpower the rest of your life. The mindfulness and acceptance skills drawn from acceptance and commitment therapy taught in this book will help your family overcome anxiety. Dr. McCurry offers a new way to think about your child’s anxiety and gives you a set of techniques used by child psychologists to help children as young as four let go of anxious feelings and focus instead on relationships, school, and fun. How to Talk So Kids Will Listen & Listen So Kids Will Talk by Adele Faber & Elaine Mazlish. The #1 New York Times bestseller on how to effectively communicate with your child. Listening on for both parents and children can be difficult, but these time-tested methods to solve common problems and build foundations for lasting relationships will help your child cope, express, engage, self-discipline, and resolve conflicts. With the successful respectful approach, make your relationship with kids of any age less stressful and more rewarding. Add this summer reading book to your list for better communication. What are you waiting for? Whether it’s anxiety, empathy, or overlooking happiness, these six summer reading books for parents can help you and your child long after the summer. Don’t let your child or teen fall into a cycle of self-doubt and depression, don’t be the parent that feels helpless and hopeless, gain confidence with these books. If you feel that you or your child needs extra support head on over to our program and see how we can help. 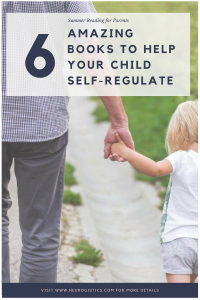 Don’t forget, these books will help you and your child feel more equipped to manage life stressors and build resiliency no matter what time of year it is. Add these summer reading books to your list today.